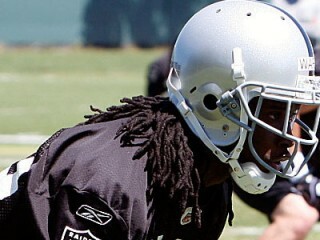 Jeremy Ware is an American football defensive back for the Oakland Raiders of the National Football League. 2009 SEASON (SENIOR): Appeared in all 13 games and started 12 games at field corner . . . named honorable mention All-Big Ten by the coaches . . . had a career-high 52 tackles, three tackles for loss (19 yards) and two sacks (18 yards) in 2009 . . . also had five pass break-ups, which ranked second on the team . . . one of two recipients of the team's President's Award for perseverance . . . appeared in 26 career games, including 16 starting assignments . . . graduated in December 2009 with a degree in sociology . . . collected a career-high two tackles for loss (9 yards), including an 8-yard sack, in the 2010 Valero Alamo Bowl vs. Texas Tech . . . collected six tackles overall against the Red Raiders . . . made three stops against Penn State . . . had three tackles and two pass break-ups at Purdue . . . tallied four tackles vs. Western Michigan . . . recorded five tackles, including a 10-yard sack, along with a pass break-up vs. Iowa . . . collected a career-high 10 tackles against Northwestern . . . tallied seven tackles and a pass break-up at Notre Dame . . . recorded six tackles, a pass break-up and an interception vs. Central Michigan. 2008 SEASON (JUNIOR): Appeared in 12 games in 2008, including four starts at cornerback (vs. Northwestern, Ohio State, Wisconsin and Penn State) . . . saw action at both boundary and field corner, starting two games at each position . . . finished fourth on the team with six pass break-ups . . . recorded 31 tackles, including 19 solos and 12 assists . . . credited with five tackles vs. Wisconsin . . . recorded his first career interception in the fourth quarter at Michigan and returned it 16 yards . . . made his first career start a memorable one, recording a career-high eight tackles and tying the school record with five pass break-ups at Northwestern . . . produced four tackles vs. Iowa . . . posted three tackles, including one for a 1-yard loss, vs. Eastern Michigan. 2007 SEASON (SOPHOMORE): Recorded one tackle vs. UAB in his only appearance of the season . . . a shoulder injury slowed his progress during spring practice in 2007. 2006 SEASON (FRESHMAN): Sat out entire 2006 campaign after transferring to Michigan State from South Carolina. HIGH SCHOOL AND PERSONAL DATA: Played for Coach Larry Gary at Lehigh (Fla.) High School . . . four-year starter who never allowed a touchdown pass against him . . . recorded 40 tackles and had seven interceptions his senior season . . . a first-team all-conference and all-district selection . . . majoring in interdisciplinary studies in social science - human resources. View the full website biography of Jeremy Ware.